5 PHOTOS BELOW ARE OF 8 JERSEY HEIFER CALVES FOR SALE: WEANED AND ARE FOR SALE AT 300.00 EACH. ALL HAVE BEEN BORN ON OUR DAIRY FARM AND WERE FED JERSEY MILK AND GRAIN. BEAUTIFUL HEALTHY JERSEY HEIFERS! We raise Nurse cows, which for the most part are calm, easy calving, easy going cows. Our main girl is Sweetie she was our first ever Jersey. 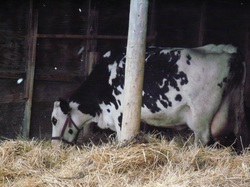 She has shown us how wonderful Jersey's can be and has produced a number of great Nurse cows for us. The nurse cows we sell are Jersey/Angus cows. They have the milking abilities of a Jersey, with rich cream and medium volume. These girls you can add an extra calf or two to them and turn them out to graze, without the worry of too much milk and issues that go along with that. These girls are easy keepers, do not tend to run down like a pure Jersey tends to and just keep more meat on her bones. We find the personalites of our crosses are that of a Jersey, very calm and easy to handle. They are not overly large cows so that helps with the handling of them. Although we state they are nurse cows, these girls make wonderful family milk cows as well. 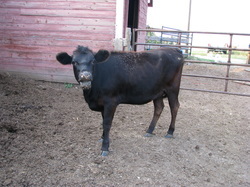 Sweetie is a 2009 Jersey/Black Angus Cow. Sweetie's first year was this past year and she did very well. She raised her calf and an extra 4-H calf for us. She is a sweetheart as her name describes, loves to have attention and ham it up to the camera. Clover doesn't really fit into our Jersey herd but she is another nurse cow we have. She is a Holstein/Longhorn cow, 2002 as well. Clover is an excellent producer of milk, she generally raises 3 calves for us. She is my husband's cow, and does not respect me as much as him. Once we get the nurse calves on her though she does very well with them. Here are a few of our past Jersey and Nurse cows. This is Lily, she was the first pure bred Jersey born on our farm. She was a very special cow. Lily went to a very nice home North of Saskatoon, fall 2010. We purchased Rhonda from a farm near Airdrie, AB. She was an older cow but a great producer. Rhonda blessed us with Famous Lily as her first calf. She was a great cow. Rhonda was sold in 2009 to a family near Gull Lake, SK. Lizzy was Sherry's first Heifer Calf out of a red angus bull. 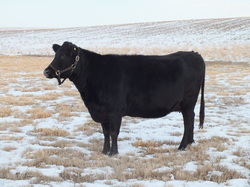 She was sold as a bred heifer to a fellow out near Youngstown AB. We have heard great things on Lizzy and how great of a nurse cow she has become. 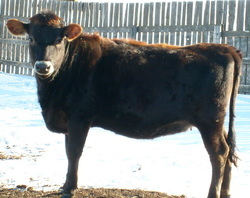 Baby was our first Heifer born here, we purchased her mom (Suzy) from a dairy up near Saskatoon. She was to have been bred Jersey so was much to my surprise when a black heifer was born. She was our baby and was treated like one until the day she moved on to her new family. Baby has been sold to a family out near Chaplin SK Fall 2011. Suzy was our second Jersey cow. She was purchased from a farm up near Saskatoon and was a great cow. Suzy blessed us with Baby and a couple steer calves before she was sold to a farm out in Christina Lake, BC. Thistle was our little heifer out of Sherry. She was meant to stay here to take over her mom's duties as a nurse cow. But we had some water issues in 2011 and she had to be sold. I am sure she will have a good home at "Last Chance Ranch" right here near Maple Creek. told and stand very still while being milked. Sold Jan 2013 to Gull Lake SK.